Weighing just 2.8 pounds, the Samsung N120-12GW mini-notebook in white improves on its predecessors with a sleeker, curvier design, a glossy LCD screen, a larger touchpad, an integrated subwoofer for 2.1-channel surround sound (via SRS audio technology), and a 6-cell lithium rechargeable battery that provides up to 6 hours of continuous use. An affordable mobile PC that's ideal for all your online needs, the N120 is designed to go almost anywhere--from kitchen and living room at home to Wi-Fi hotspots at coffee shops, airports and more. It sports a 10.1-inch LED-backlit SuperBright screen and a 97-percent full-size keyboard that's easy to type on and includes an innovative coating that helps create a more germ-free environment. It's powered by the 1.6 GHz Intel Atom N270 processor, which is designed especially for mobile devices and features an innovative hafnium-infused circuitry that reduces electrical current leakage in transistors to conserve energy. The integrated 54g Wi-Fi networking (802.11b/g) will keep you connected to email and all your social networks, while the Bluetooth 2.0+EDR technology enables you to use handsfree communication headsets while video chatting via the integrated 1.3-megapixel webcam. This model comes in white, but it's also available in black. Other features include a 160 GB hard drive, 1 GB of RAM, built-in speakers and microphone, SD/SDHC/MMC memory card reader, three USB ports (with two of them able to charge your peripherals), and a VGA output to an external monitor. It comes preinstalled with the Microsoft Windows XP Home operating system, which offers more experienced users an enhanced and innovative experience that incorporates Windows Live features like Windows Live Messenger for instant messaging and Windows Live Mail for consolidated email accounts on your desktop. The 97-percent full-size keyboard makes it easy to type no matter where you are. It also has an innovative coating that help create a more germ-free environment (see larger image). There's plenty of room for everything you download from the web with 160 GB of hard disk drive storage. Plus, you'll enjoy a quick system boot-up and fast access to stored information. The N120 offers 1 GB of installed RAM, delivering maximum netbook performance for accessing the Internet and enjoying streaming multimedia. With its LED-backlit SuperBright 10.1-inch wide LCD, you can view the Internet or any application in full-screen mode (at a 1024 x 600-pixel resolution) without compromise and in a clear and comfortable display. Video is powered by Intel's integrated, power-efficient 945GSE Express chipset, which features a 32-bit 3D graphics engine based on the Intel Graphics Media Accelerator 950. Enjoy a full and rich multimedia experience on the go with high-quality sound thanks to the integrated SRS 2.1-channel system, featuring 2 x 1.5 watt stereo speakers with a dedicated subwoofer. It also offers an integrated audio chip that's compatible with HD Audio. An integrated 1.3 megapixel digital motion camera makes it easier than ever to keep in touch with friends and family, using video-conferencing or live messaging. The camera combines the resolution and image quality of a still camera with the sustained high frame rates of a video camera. 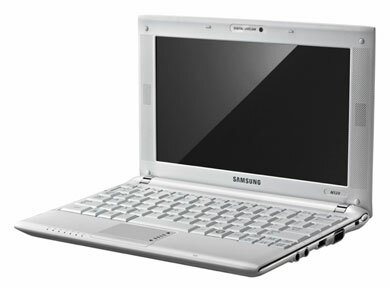 Pre-installed with Windows XP, the Samsung N110 includes the following software: Samsung Recovery Solution III, Samsung Magic Doctor, Samsung Update Plus Easy Display Manager, Easy Battery Manager, Easy Network Manager, Easy SpeedUp Manager McAfee Virus Scan, Adobe Acrobat Reader. 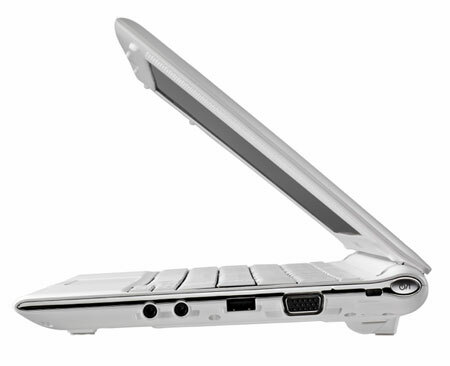 This netbook measures 10.71 x 7.4 x 1.17 inches and weighs 2.8 pounds. This mini-notebook includes a six-cell (5200mAh) lithium-ion battery for up to 6 hours of use. This package includes the Samsung N120-12GW, rechargeable battery, AC adapter, and printed operating instructions. It's backed by a one-year warranty. Before I bought the Samsung N120, I bought an eeePC 1000HE. The latter got good reviews everywhere, but I had a couple of serious problems with it. First, the right shift key is tiny, and I end up missing it all the time and hitting an arrow key instead. Second, the left-click and right-click buttons are extremely stiff--so stiff, in fact, that I usually use a wireless mouse or operate the machine using track pad gestures rather than mouse clicks. I was able to find my Samsung for $392, shipped, and at that price, it has been worth every penny. I decided a few weeks ago that I wanted a netbook. After researching all of them on Amazon, and being a Mac person, I went with the ASUS Eee PC 901 8.9-Inch Netbook (1.6 GHz Intel Atom N270 Processor, 1 GB RAM, 20 GB Solid State Drive, 20 GB Eee Storage, Linux, 6 Cell Battery) Pearl White. I thought it might be fun to try out Linux and I wanted something small enough to carry in a purse. The Asus was cute, I liked using Linux (Xandros), but that keyboard was absolutely unsatisfactory. The netbook was in serious danger of being thrown/smashed/stepped on. So I sold it to a colleague, who bought it for her six-year-old daughter. I went back to researching. I liked this Samsung's keyboard, but hated the idea of using Windows. I ordered it anyways. I have had it two days. This is a solid, well-built, quiet/silent, cool-running netbook. The keyboard is evey bit as good (for me) as my Mac laptop at work. I do occaisonally find that my cursor has wandered off, and it's probably me accidentally brushing across the touchpad. I'm using an external wireless mouseKensington Ci70LE Wireless Optical Mouse Rouge K72275US, but I have left the touchpad enabled - it's one of the better touchpads I've used - I just prefer a mouse. A few reviewers noted the high gloss screen. That has not been a problem for me. I haven't taken it out in the sun, so I can't address those issues of glare. Using it here in my livingroom, I am not aware of any glare or reflection on the screen. It's a sharp, crisp display - it IS more bluish/cooler and this might impact photo processing. The display is 1024 x 600. There is a resolution manager which will switch the display to 1024 x 768. I can't imagine using it in that mode - it's distorted, as another reviewer noted. I'm still not happy with Windows - I spent all of the first day downloading mountains of updates for every program on here. And there ARE a number of proprietary Samsung programs. But thus far, the XP OS is working well. I'm using an Apple Time Capsule as my wireless router, and this computer connects in a few seconds - less than 20. Windows also loads very quickly - I can turn the computer on and be online in under a minute. And it is lightning fast online. I am thrilled with this netbook. 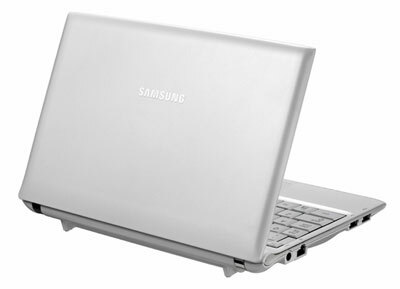 I know lots of reviewers have said not to consider using a netbook as your primary system, but I really think you could with this (Samsung N120). I've loaded a full Office 2007 (and ITS mountain of updates), about 5 GB of podcasts, a few games, and it's still very snappy. I haven't upgraded to 2GB memory yet - only because I've misplaced the new chip. The NC10 feels like its better made for some reason. The shiny plastic although a finger print magnet has a more quality feel to it. It just feels sturdier and more solid. The N120 plastic case feels a little cheap to me. Upside is it does not attract any finger prints and looks somewhat cool. I found the colors on the NC10 to be more accurate. I compared the both of them while watching a Toy Story clip and definitely saw that this was evident. Also, the N120 by default has a slight bluish tint to all the colors. You can correct this by adjusting the color gammas but you won't get it 100% accurate like the NC10. This prob wont be a big deal to most as Netbooks are not really meant for serious photo editing or processing. The keyboard on the N120 is a lot more comfortable to type on. No doubt about it. The small difference in size of the keys really makes a huge difference with typing. However, the keys have a slighlty cheaper feel to them compared to the NC10. I almost feel Samsung used cheaper plastic to cut back on weight to make the N120 comparable in weight to the NC10 due to its larger size and bigger battery. Just a theory. The touch pad is a huge improvement I think on the N120. Using the one on the NC10 started annoying me after a few minutes. The N120 touchpad works great and has a better feel to it. I didn't find the sound on the N120 to be much of an improvement over the NC10. Do not buy the N120 based on its subwoofer 2.1 sound system because you will be disappointed. The difference was VERY slight. I didn't really have the chance to compare the battery life but both models are excellent and I'm sure the difference would probably be just an hour. In the end however I ended up keeping the N120. My reasons were mostly for the nice gloss screen and bigger keyboard. I'm partial to gloss screens because I enjoy the vibrant colors they put out for movies and pictures. It also makes internet surfing more enjoyable to me. Just a personal preference. I also felt that typing on it was a lot more comfortable. The NC10 keys felt cramped to me even though my hands are only average in size. Samsung's N120 is absolutely amazing and I'm very happy with the purchase. I did a lot of research over the past few months - and I'm not willing to settle for a netbook with less than six hours of video watching time or 10 hours of surfing/work time - I'd rather not have one honestly. The N120 delivers and more. The keyboard is easy to use - much more comfortable than most for plane travel because of the unit's overall small weight and footprint. In addition, the mouse trackpad works great - very impressive. While the screen is reflective like all the new netbooks - and I did want a matte screen - like the other reviewers said, it's about as non-reflective as a reflective screen can be - no complaints here. Samsung took their immensely successful first generation NC10 - integrated the consumer feedback and delivered once again. The build quality and specs made this a no-brainer for me. I was leaning toward the HP and Lenovos but they haven't been able to strike a balance between long battery life (all 6-cell netbooks are not created equal) and weight. Samsung did it with the NC10 and they're doing it once again with this second generation: N110 and N120. If this second generation hadn't just come out, I would have likely bought the NC10 if any. Obviously, Samsung is reading the consumers better than the rest of the pack. It even comes with its own neoprene-like (thick cloth) sleeve - which you'll have to add your own velcro to. Why they chose to not put a velcro closure on it is a very good question. Overall, I would buy this again - and will recommend to friends and clients. This is a great cheap laptop and I plan to use it as my main computer. The keyboard is great and the trackpad and buttons are acceptable. It makes a great word processor, Web browser, and player for DVD-quality videos. Note that the screen is 8.78 inches wide and 4.94 inches tall (a 16:9 ratio) even though the pixels are 1024x600 (a 16:9.4 ratio). So the screen is 117 dpi horizontally and 121 dpi vertically -- each pixel is stretched horizontally by four percent. I wanted to get a netbook to have a computer that was portable. I do own a dell m4300, but it was heavy. Especially, when my family and I travel during the summer, I wanted something that I could listen to music and books and do e-mail on the go. I did a lot of research on netbooks. It's keyboard. I have seen a few netbooks from other college friends and the keyboards did not amaze me. Samsung has outdone it on this product. The keyboard was very easy to type on. My only thing is I wonder why they only chose to include one windows key? Anyone have anythoughts on that one? Oh well, just one little odd design issue one can get used to. Battery life was also great. I got between 6-8 hours on a charge. From the first day I got it, everything just worked. I was able to do skype with no problem. People on skype say my internal microphone sounds quite good. Listening to music and browsing the web was also a snap. It found my wifi network right away-I was able to enter the wpa2 key and connect. 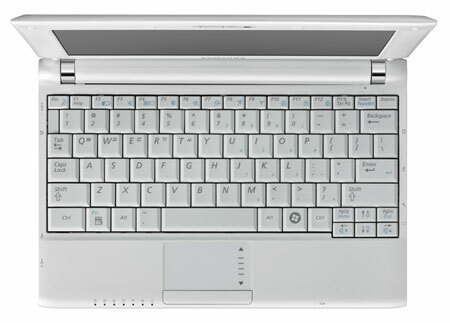 If you are looking for a computer with great audio battery life and a great keyboard then the n120 is the netbook for you. I just sold my HP mini 1000 on Craigslist. It was a nice netbook but short on battery life and storage space. I also have an original acer aspire one 8.9" with extended battery. That laptop was nice but screen is a bit small but has a nice bright screen and a somewhat cramped keyboard. But ok battery life. I still have that one. I also have a MSI wind U120 which isn't bad but battery life isn't great but ok. And then I have an ASUS 900HA, that was pretty cheap at less than $300. Its very small but the keyboard on those Eee PCs aren't very good (bad place for shift key) but the small size makes up for it as its smaller than the acer aspire one 8.9 inch but isn't good for long sessions . Now I just got this from amazon for $399 and its my very favorite. The quality of the Samsung N120 is outstanding. The computer is Matte finished so no more fingerprints. The glossy screen is very nice and bright. Battery life is the best of all four. The keyboard is perfect at 97% full size. I want to sell my other ones except maybe the asus 900HA. Fantastic Netbook: Large Keyboard, Long Battery Life, Light, and Silent!! I had purchased an Asus 1000 netbook for my son over the holidays and decided that I would get a netbook for my own use. My biggest complaint about the Asus was the small keyboard and weak speakers. It would be unrealistic to think that the sound from a netbook would be great, but there definitely has been room for improvement. The keyboard is wonderful and typing is a breeze. Very comfortable. The Samsung N120 is a wonderful solution. They keyboard is full-size (or as near as matters) and they've paid attention to the sound system with an SRS audio card and a miniature sub-woofer...with an emphasis on miniature. Overall, a wonderful little computer. The processor and hard drive are pretty standard for netbooks, but uses the ample battery very efficiently. I have not timed battery usage under different processor loads, but from what I can tell, the professional reviews are accurate. I am not a fan of Windows XP and tried installing Ubuntu 9.04 remix as a replacement. My home system is configured using WEP2. The Samsung could SEE my router, but would not connect. Several of the Fn keys also did not work properly. I've given up until the issues are addressed elsewhere and contented myself to running the Windows 7 RC. It works great. Everything worked great on the initial install. Nevertheless, I also downloaded VISTA drivers for the Synaptic Touchpad, Atheros WiFi, and Realtek High Definition Audio to gain additional functionality. No problems. BTW, I created a complete backup of the Windows XP system using the Samsung III recovery software included with the package. Technically, I now have a dual-boot system with XP & Windows 7 onboard. Any downsides for me? I had wanted a Solid State Drive and may upgrade in the future. The 160 GB drive in the current machine works great and as I said, the computer is silent and runs cool. I also wish that the netbook had adopted 802.11N, but also realize that it probably won't make a big difference in a netbook. I probably would have preferred a matte screen, but if that REALLY becomes a problem I think you could buy a Matte Screen protector and trim-to-fit the 10.1 inch screen. So far, I love it. Received this product in Mail yesterday, haven't been able to put it down yet, outstanding netbook, will use more than my 17" toshiba laptop. Added the extra 2 meg ram, easy access under laptop unlike aspire. Sound is very good, larger keyboard and screen is great.Loaded the same software as larger laptop and all works great, love the bluetooth for printer access or whatever, Image backup included works great also. So I bought this on day 1 of its availablity on amazon for 475$ including 2 days shipping. I was expecting a special netbook since I was paying so much (the acer of similiar size and configuration costs 350$). It turns out to be a very pretty looking net book. I am yet to test battery. The sound is as good as my previous acer netbook. I dont know why they made so big deal about it. May be it was poor quality in previous samsung netbooks. I bought this last week after reading a LOT of reviews on various netbooks. I wanted something lightweight, durable and reliable for traveling especially via plane. I have a fairly portable laptop already but every extra ounce seems to really seem heavy walking through airports, NYC, etc. I also like the idea of being able to carry a lightweight machine to public places where i can get a little work done without needing to carry a laptop, power cord, etc. I was a little worried that a netbook would not be 'enough' but so far it has been outstanding! This particular netbook is far nicer looking and seemingly more durable than ANYTHING i've seen at local stores. Although the screen is advertised as 'glossy' it is not overly so and looks nothing like the HP and Asus 'glossy' screens. The keyboard is fantastic and the built in track pad works really well. Battery life has been very good - I got close to 8 hours the first time I charged it. 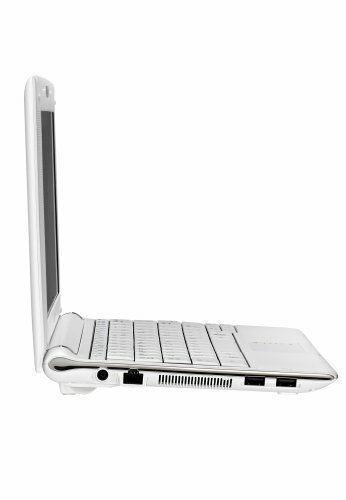 This netbook is comfortable to type on and has rounded edges. The speakers are decent and certainly better sounding than many other netbooks on the market. I recently loaded Office 2007 - it runs just fine. I also UN-Loaded the pre-installed McAfee software, replaced with AVG and that was a good decision - things are much faster without McAfee. I plan to upgrade to 2 gb of RAM but right now everything runs just fine with the installed 1 gb. Although a netbook will probably not ever replace my laptop, it is perfect for the times i want/need to have computer access for internet, email and word processing/office type work. The convenience of being able to take this very portable, lightweight machine with me is a real bonus!